Interested in art and yoga? 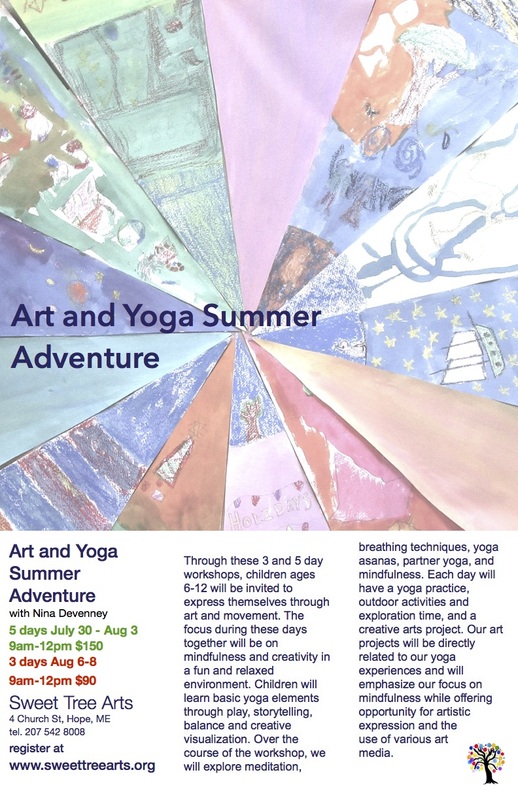 If so, Sweet Tree Arts Center in Hope is offering a class Art and Yoga Summer Adventure with Nina Devenney for children ages 6-12, July and August. For more info or to register CLICK HERE. LEAPS of IMAGINATION is an in-school art program for students in underserved communities. Our team of eight mentor artists interweaves art, literacy, science and mapping to create month-long projects with environmental sustainability and social justice as overarching themes. Recognizing that art is a vehicle for teaching thinking, our projects support class curricula and empower children to participate in local and global issues. We work with children in their classrooms for two hours each morning twice each week. Envisioning programs that cut across disciplines, artists dovetail literature, environmental exploration, and artwork with student interests. LEAPS of IMAGINATION’s MISSION is to ignite the imagination and inspire new ways of thinking so that young people can realize that their ideas have purpose and that they have the courage to act on them. LEAPS of IMAGINATION was a Maine Arts Commission Arts Learning grant recipient this year. Who says art doesn’t impact our day to day world? 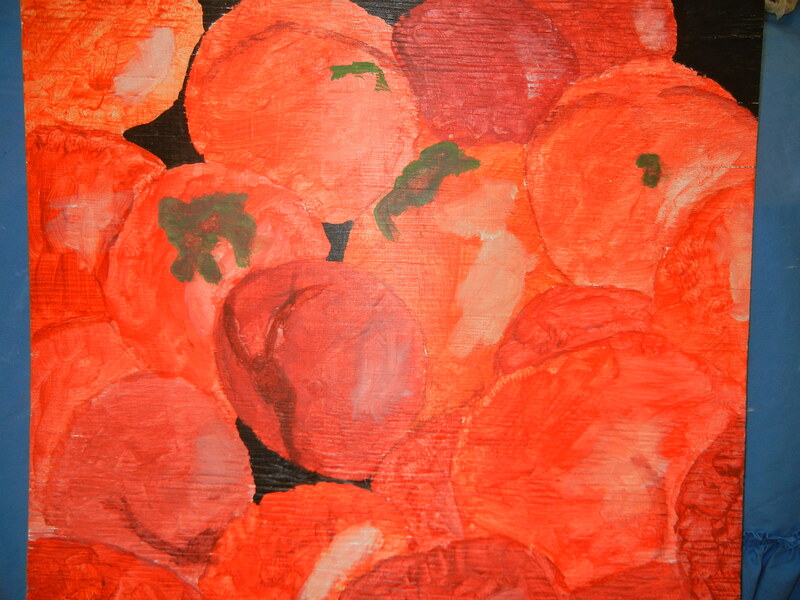 Wonder about how art; color, movement, and composition impact our food interests? Read this interesting article how food creators and researchers are thinking what to prepare to attract diners. A salad created like ‘s Painting No. 201. “Charles Michel, who is the chef in residence at the Oxford Crossmodal Research Lab and the lead author of the study, tells The Salt he chose Kandinsky’s work for “the specific association of colors and movement. His chef’s mind saw a salad, particularly the mushroom shape in the top left corner, and the experiment took shape.” Click here for the article. Thank you to Anne Kofler for sending this link. Dozens of teachers have been hired in the Milwaukee schools recognizing that the arts and physical education are essential to learning. They also hope that the teachers will make a difference in the excitement about attending schools and having a positive impact on test scores. You can read and/or listen to the article by clicking here. Erin Toner, writer, June 23, 2014. The students and staff of Troy Howard Middle School in Belfast has used their collaborative creative energy to combine two facets of the school’s program to form a fascinating art exhibit at the Belfast Co-op. 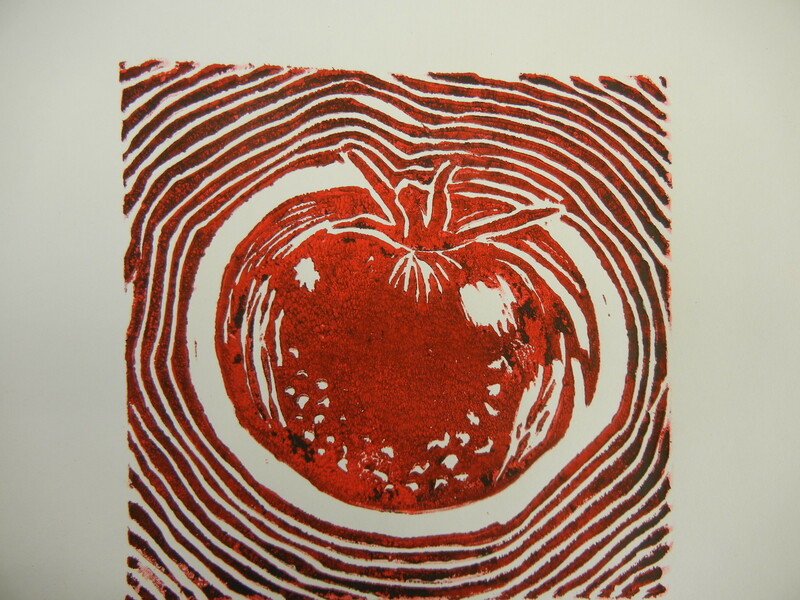 The title of the show, “I say Tomato ,You Say Tomato” reflects the ecology department as well as the art department. Each year the two departments coordinate using a theme to represent Troy Howard Middle School’s philosophy. This includes Ecology as one of it’s three Academies and the Art Department as an essential piece to all criteria of Education. 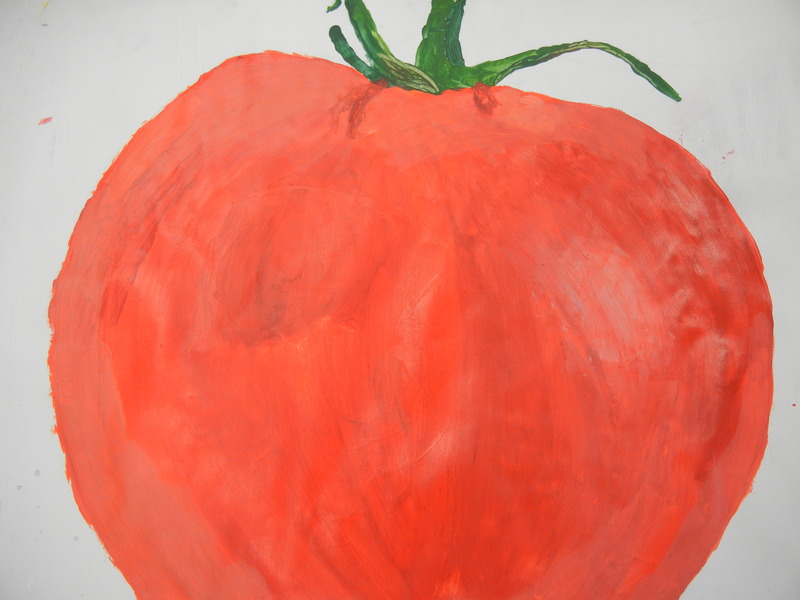 The show is comprised of 12 Tomato projects. Mediums include clay, paper mache, paint, pencil, ink, and a full sized farmer! Pieces are for sale and six have been sold! The show runs until the end of the month-don’t miss it! 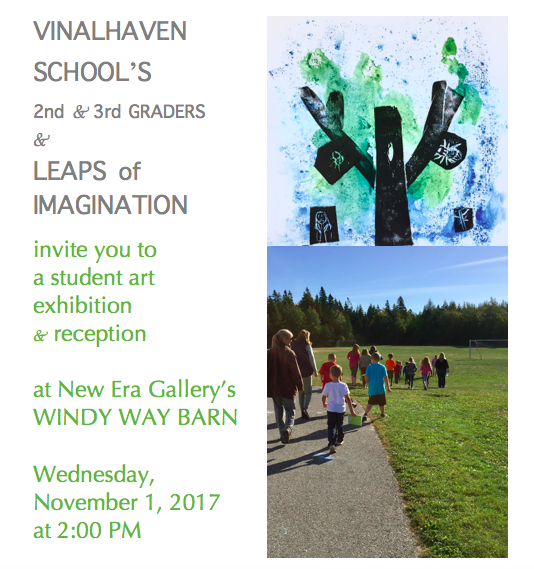 Thank you to art teacher Lynnette Sproch for sending the information and photographs for this blog post. Lisa Wheeler is an artist and art educator who has been working with an afterschool program called Kids Express. 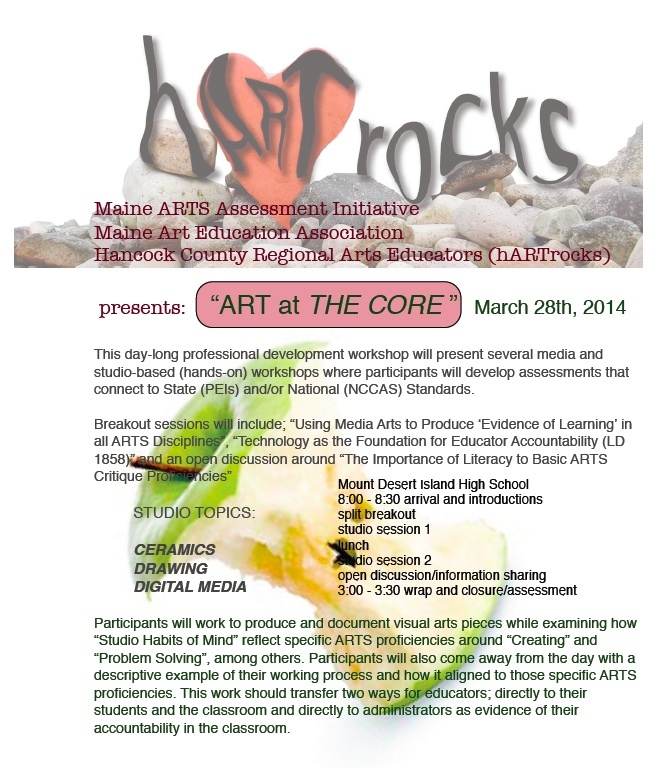 The program was held at the A.S. Hall School in Waterville. She believes that art and other content should be connected. The information below, in Lisa’s own words, describes the program. 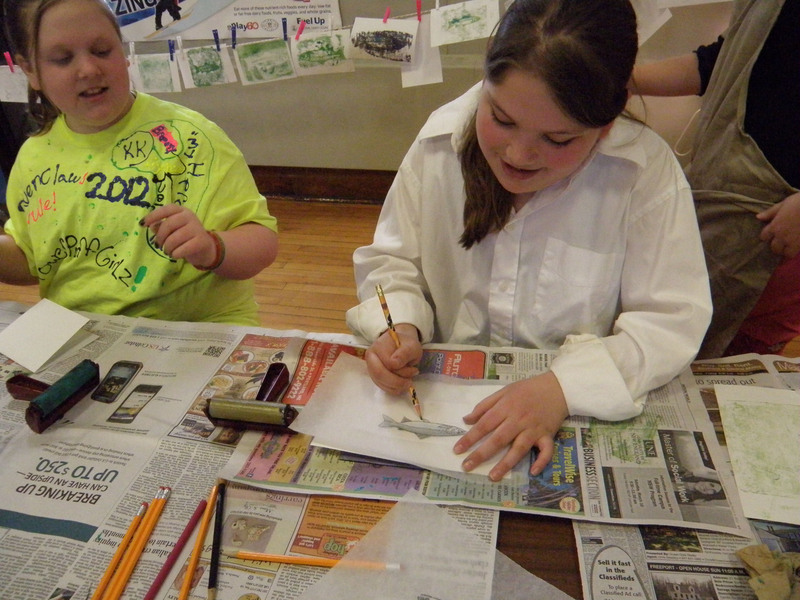 Kids Express is an after school program of arts and culture serving up to seventy 4th and 5th graders a year at the Albert S. Hall School in Waterville. Started in 2006, it has always had a strong visual arts component. Each year the program seeks to produce at least one piece of public art that is given as a gift to the school. 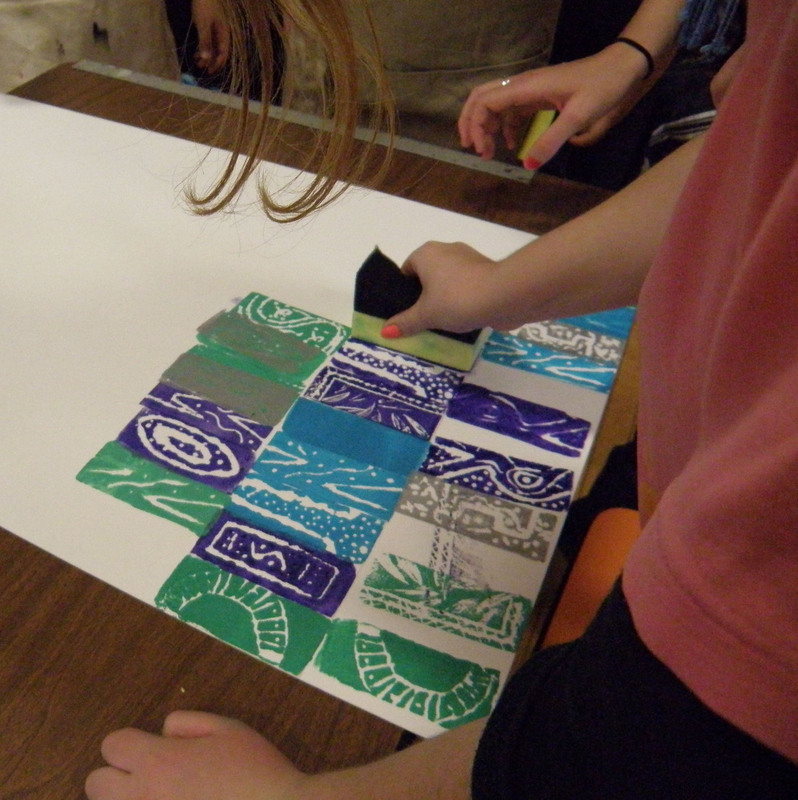 It begins as a joint effort among the student artists in a given class. 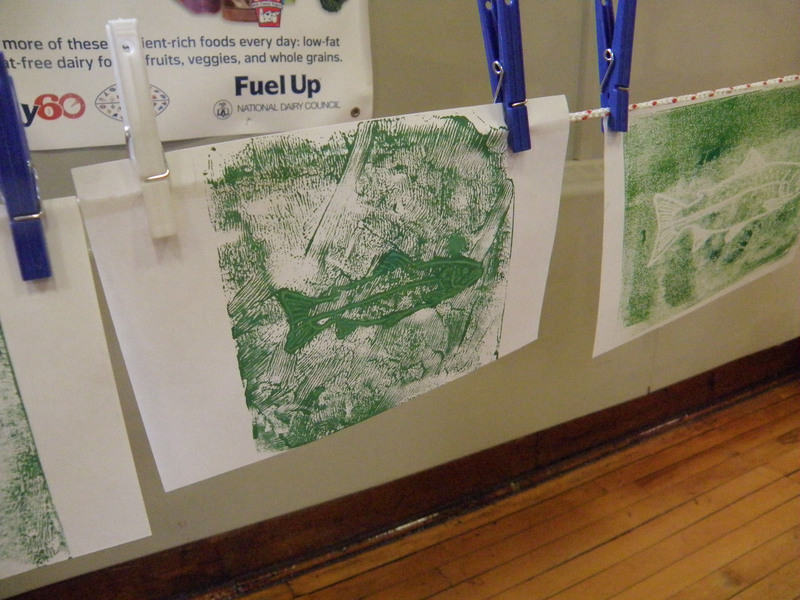 During the spring session of a Printmaking class, teaching artist Lisa Wheeler was approached by 4th grade teacher, Mrs.Dunn, about Atlantic Salmon. You see, the entire school is learning about the life cycle of Atlantic Salmon on the Kennebec River. All 250 students have been watching salmon eggs gestate in a special aquarium in the school lobby, excited that the eggs finally hatched in late March. Mrs. Dunn asked Mrs. Wheeler if there was some way to incorporate that into a printmaking project. “I was thrilled to be asked to participate in this school-wide learning activity, long believing that a collaboration with other content areas provides extra value in learning for the students and also an extra boost for the arts.” says Mrs. Wheeler. The hand-printing processes lent themselves perfectly to this group project. Student artists each created multiple trace monotypes of Atlantic Salmon which were cut out to be used on a large collage. 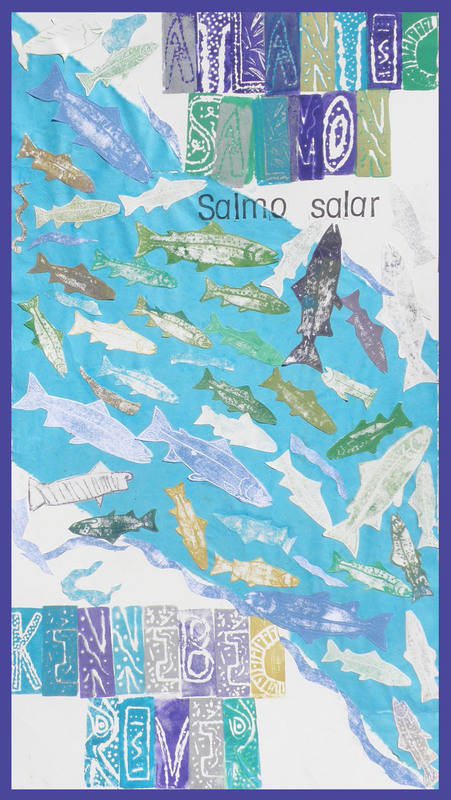 They learned about reverse printing of words as they created hand stamps of the words ‘Atlantic Salmon’ and ‘Kennebec River.’ They assembled the cutouts onto a large piece of illustration board that had been stamped over a bright turquoise paper river. The result is a colorful piece that exemplifies the natural relationship between art and science, a piece that already has student artists proudly saying, “I made that one!” and one that will join the other pieces of public art in this special school. And hopefully this hands on learning project will have the students “swimming” with knowledge. Follow-up: As a follow up to the science part of this story, the salmon eggs were released last Friday morning, 5/4, and the Waterville Morning Sentinel ran a photo of the students on the front page. Exciting stuff! Thank you to Lisa Wheeler for sharing this story for this blog post.